25 years… It can take up to 25 years before symptoms of Alzheimer’s disease become obvious, and by then it is too late to prevent its devastating effects. It is estimated that currently 5.7 million Americans are living with Alzheimer’s, and that number could reach 14 million by 2050. Every 65 seconds someone will develop the disease, and yet after decades of research a cure remains elusive. With the increasing need for early detection of Alzheimer’s, Dr. Maya Koronyo-Hamaoui, head of the Alzheimer’s research laboratory at Cedars-Sinai in California, pioneered a discovery that revolutionized the detection of Alzheimer’s and other forms of dementia. Her team found that the amyloid-beta protein prevalent in the brain of Alzheimer’s patients is also present in the retina. “People thought pathological changes were just restricted to the brain,” explains Dr. Koronyo-Hamaoui. ”[My team has] shown that you can actually find it in the back of the eye in an organ that is part of the brain.” The brain can’t be scanned because it is shielded by bone, but the retina is in an accessible location. Consequently, Dr. Koronyo-Hamaoui and her team developed a retinal scan to detect Alzheimer’s disease before symptoms are present. The scan is the first way to determine the presence of the beta-amyloid protein noninvasively. Dr. Koronyo-Hamaoui mentioned that this scan could be useful in diagnosing other dementias. In the live rodent models with Alzheimer’s, the scan showed accumulation of the beta-amyloid protein, providing further evidence of the scan’s potential in diagnosing the disease in humans. However, scans like these have their drawbacks. It is normal to have beta-amyloid proteins in the brain. The accumulation of the protein is an indicator of Alzheimer’s, but not everybody with accumulation develops the disease. There is a chance of predisposition, but much like other diseases, Alzheimer’s will result only in a handful of these people. It may be possible to combine information from retinal scans with other risk factors, but this strategy must be explored further. The earlier Alzheimer’s is diagnosed, the sooner researchers can start studying the course of the disease and developing a cure. We know a lot about Alzheimer’s, but most of the information has yet to bring us closer to a cure. 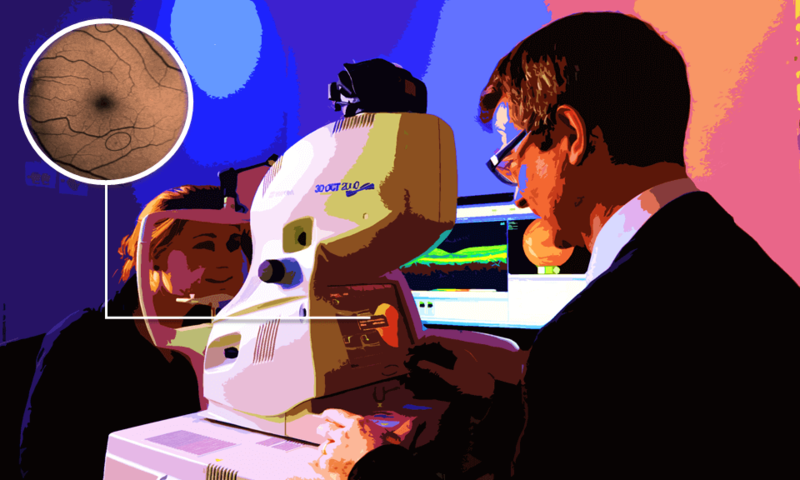 The retinal scan could be the key to discoveries that advance understanding and lead to treatments decades before symptoms appear. “Cedars-Sinai Device May Provide Early Detection of Alzheimer’s Disease.” Cedars-Sinai, www.cedars-sinai.edu/Research/Research-Areas/Neurosciences/Featured-Stories/Cedars-Sinai-Device-May-Provide-Early-Detection-of-Alzheimers-Disease.aspx. Accessed 21 Aug. 2018. Koronyo Y, et al. 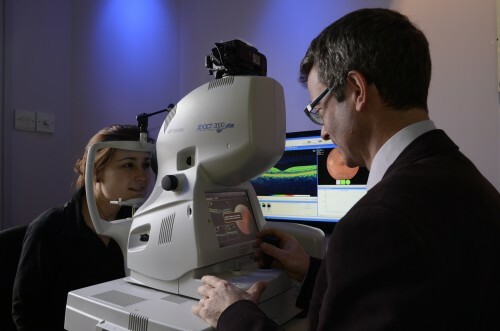 “Retinal Amyloid Pathology and Proof-of-concept Imaging Trial in Alzheimer’s Disease. – PubMed – NCBI.” National Center for Biotechnology Information, National Center for Biotechnology Information, 17 Aug. 2017, www.ncbi.nlm.nih.gov/pubmed/28814675. Accessed 21 Aug. 2018. Obioha, Anasia. “Noninvasive Eye Scan Could Detect Key Signs of Alzheimer’s Disease Years Before Patients Show Symptoms.” Cedars-Sinai, Cedars-Sinai, 17 Aug. 2017, www.cedars-sinai.org/newsroom/noninvasive-eye-scan-could-detect-key-signs-of-alzheimers-disease-years-before-patients-show-symptoms/. Accessed 21 Aug. 2018. “Predicting Alzheimer’s with an Eye Scan.” Naturopathic Doctor News and Review, Naturopathic Doctor News & Review, 28 Aug. 2017, www.ndnr.com/naturopathic-news/predicting-alzheimers-with-an-eye-scan/. Accessed 21 Aug. 2018. “Research Areas.” Cedars-Sinai, Cedars-Sinai, www.cedars-sinai.edu/Research/Research-Labs/Koronyo-Hamaoui-Lab/Research-Areas.aspx. Accessed 21 Aug. 2018. Waghorn, Mark. “Eye Scan Could Spot Alzheimer’s Decades Before Symptoms Emerge.” New York Post, New York Post, 21 Aug. 2017, www.nypost.com/2017/08/18/eye-scan-could-spot-alzheimers-decades-before-symptoms-emerge/. Accessed 21 Aug. 2018. OCT Retinal Scan by Hammond Optical (Edited). My name is Lasya Balachandran, and I’m currently a sophomore at High Technology High School (NJ). This is my first year participating in Curious Science Writers, and this program has allowed me to research scientific findings and grow as a writer by sharing these findings in a way people can understand. Outside of High Tech, I am a member of the Marlboro High School varsity tennis team, and I enjoy doing math, playing viola and piano, and reading news online. Thanks for reading! Thank you for writing this article, Lasya. Many people have family members (for me, my grandfather) suffering from Alzheimer’s. We need to combat this devastating disease, and research in this direction is a key step .